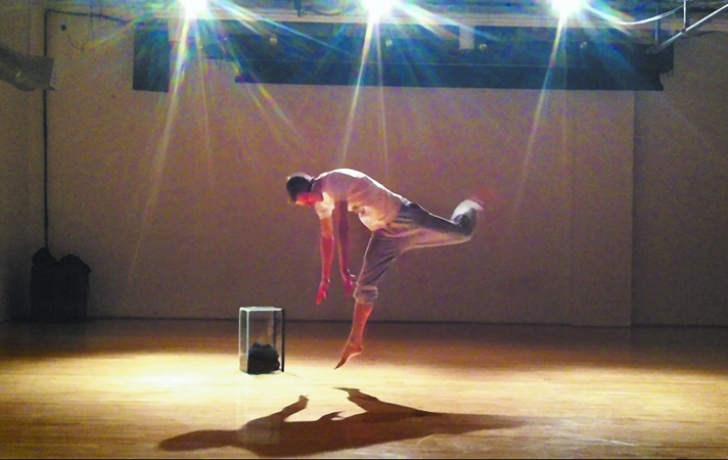 Robert Tyree will perform at the Performance Mix Festival, taking place at the Flea Theatre from April 8 to 14. It was a mere 34 days until the opening of her Performance Mix Festival, a week-long celebration of dance that she has faithfully organized for 27 years, and ticket sales weren’t going well. Indeed it does. The successful event, which brings 30 performers from around the country as well as Canada and France, is a go-to event for fans of experimental dance. The festival, held at Tribeca’s Flea Theater on White Street, is part of New Dance Alliance, an arts organization Bernard started in 1986 that promotes emerging forms of innovative dance. Bernard notes that although many of the works in the festival are inspired by ballet, jazz or modernists such as Martha Graham, the comparison ends there. When Bernard talks about festival performances, though—using words like “crazy,” “quirky” and “amazing and exciting”—it sounds like anything but everyday. One of the dancers’ movements reminds her of German Ex­pressionism. Another has a poetic feel to it. “I like dance that isn’t just a flowery, pretty thing, but serves a purpose,” Bernard explains. This year, Michael Freeman will perform excerpts from a dance musical based on a transgender theme. Lindsey Dietz Marchant, a member of the Nina Winthrop and Dancers Company, will explore the idea of solitude. Bernard, 64, will show her performance piece that deals with older women and their feelings about body image and mortality. The wide range of ages among the performers is unusual in dance, Bernard notes. Festivals for experimental dance are hard to come by these days, Bernard said, because there’s less funding around to support them. The Performance Mix Festival has survived largely on a handful of grants, box office sales, individual donations and a silent auction. But the expenses are high, she added—from renting the theater to paying salaries to printing programs. Bernard does a barter with a videographer, for example, who uses her studio. And rather than put up out-of-town dancers in a hotel for a week, Bernard welcomes them into her loft, where they sleep on air mattresses. The festival closes with performances by three veteran tap dancers—the perfect note to end the week, Bernard said. Performance Mix Festival is at the Flea, 41 White St. April 8–14. $15, students and seniors, $10. Tick­ets at newdancealliance.org. See website for information about closing party and free breakfast and discussion.